Looking back at my last few posts it looks like I've been on a bit of a vintage hiatus of late! But never fear, I am back with a proper vintage beauty from Lindy Bop. 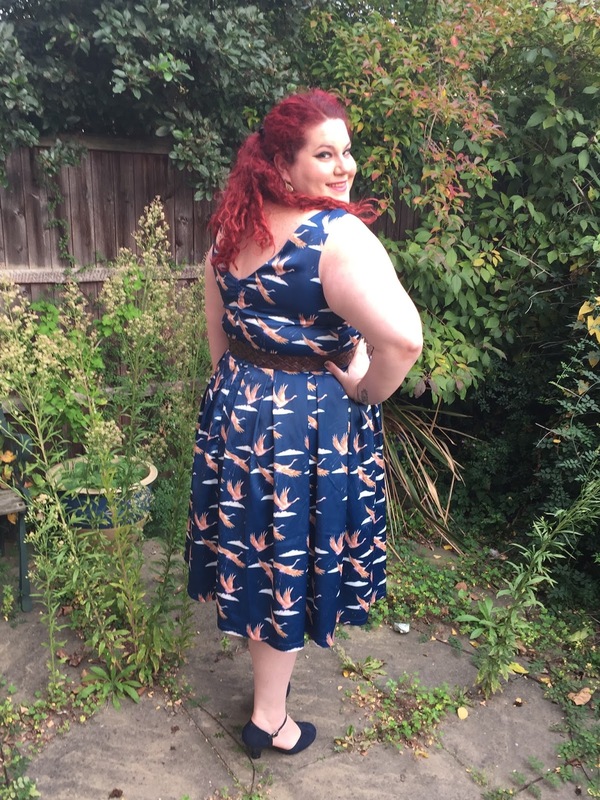 I have reviewed Lana dresses before, and it is one of my favourite vintage shapes. I wore this to the Curve Fashion Festival in September and the response to the picture I posted on Instagram was inspiring, so I thought it was high time I reviewed this bird print beauty. I already have Lana in Green and Dark Blue Floral, both of which I absolutely adore. This print, however, is a little different. Instead of the cottons of the other Lanas, the Blue Crane is synthetic and has an almost satin like quality - smooth and slightly shiny. The print - vaguely oriental, with pinky orange cranes soaring across a blue sky with a scatter of clouds - is quirky and yet manages to be classy too. It kinda reminds me of the flying duck wall hangings that were so popular in the 50s and 60s, and I can imagine a repressed Betty Draper wearing it to one of her dinner parties (where no doubt Don would be drunk and feeling up one of the guests, but never mind). So yes, for these many varied aesthetic reasons I wanted this dress. I once again went for a size 22, and just as before the fit is perfect. On my 5'8 it sits well below the knee and looks great with a small heel. I still adore the dropped back which just makes this dress for me. It is even more of a statement on this dressier version of Lana. Here I am not wearing a petticoat, but in the final picture (taken on the day of the Curve Fashion Fest) I have a Lindy Bop petticoat underneath, and you can see how beautifully it accentuates the shape of the skirt, like a bell. I have added my own belt for definition, as once again the fabric belt it comes with doesn't fit. I really would like to try a Lana with its intended waspie belt, and I am aware that Lindy Bop is doing work on their sizing so I do hope that this gets sorted. An inconsistency I have noted with the Lana dresses is that some are fully lined and others are not. With the Blue Crane only the bodice is lined. Full lining isn't necessary but I would like to see consistency across the style. The Blue Crane Lana is just lovely. Easy to wear, reasonably priced, and a great occasion dress (special enough to dress up for something fancy). The only think I hope is that Lindy Bop continues to add prints to its collection of Lanas as this is just such a wearable style. You can read another review of the Blue Crane Lana over on the gorgeous Katie's blog - Life Through Kate Eyes. Let me know what you think of Lana in the comments. Do you have any Lanas in your wardrobe? What's your favourite Lindy Bop dress? The blue looks phenomenal with your complexion ... and look at your iddy biddy tiny waist! Stop looking so beautiful is so many amazing dresses you're making me jealous!! You look amazing! The dress is so pretty, and I love the shoes too.